Maritime heritage is a popular subject in the media. The Maritime Programme was able to contribute to many articles in newspapers and magazines, news items and (short) documentaries. Some highlights of the subjects that gained publicity and the corresponding fragments can be found below (in Dutch, except for the South Korean interview below). In the last week of December 2015, the series Oosterschelde's Odyssey can be seen daily on NPO2. Wednesday, December 30, the episode is dedicated to Cape Horn. Martijn Manders and René Rentinck were followed to Puerto Deseado, a desolate area in southern Argentina with a special significance for Dutch maritime history. Manders and Rentinck tell us how, along with Argentine colleagues, they did archaeological research as part of their search for the remains of the Hoorn. In 1615 the ships the Hoorn and the Eendracht left Horn, led by Willem Schouten and Jacob Le Maire, sailing to Asia with the intention to bypass the VOC monopoly via a southern route. The Hoorn was lost on the coast of Argentina. In January, it’s the 400th anniversary of Schouten and Le Maire discovering Cape Horn. In 2016 we will publish more reports and articles in our eMagazine on this. These will include interviews with local archaeologists, historians and residents about the importance of this maritime heritage for the history of Argentina and the Netherlands. Check our Facebook page regularly! 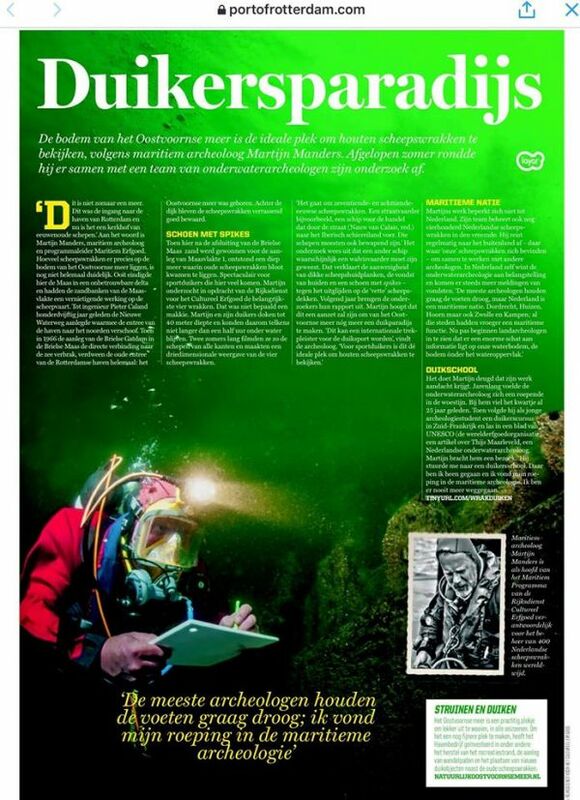 An article in the newspaper of the Port of Rotterdam (Havenkrant) on maritime archaeology, the archaeological research in the Oostvoornse meer and the special wrecks there you can admire underwater. 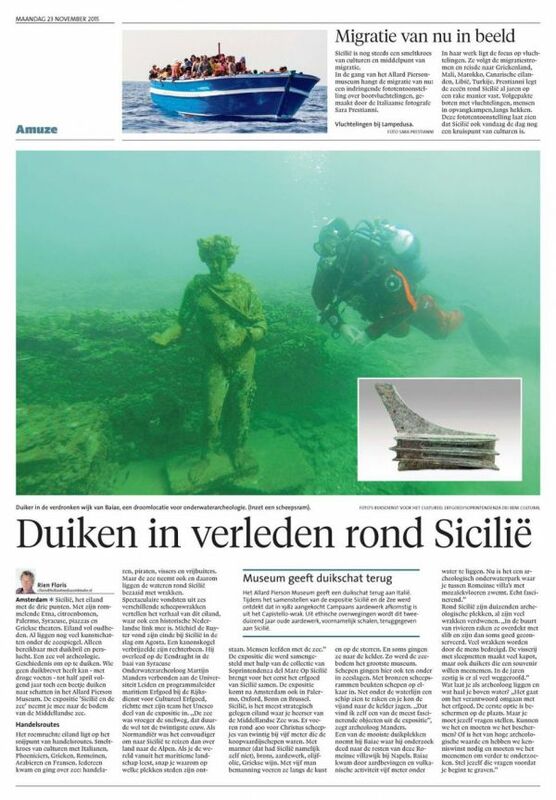 In the newspapers of the Holland Media Combination an article about the exhibition: "Sicily and the sea”. 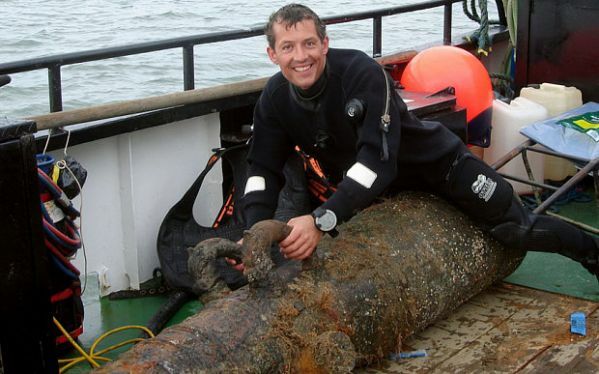 Martijn Manders is interviewed about the maritime history of the island and speaks about archaeological research in one of the most beautiful diving spots in the world.